Download one of the builds below, or play Fall in the game window above on platforms that support WebGL. Press and drag to start aiming a launch, release the click when ready to leap. A game-pad may also be used. For an Xbox 360 controller, press and hold A while using the analogue stick to aim the launch. Release the A button to fling in that direction. Collect wings to gain score. Touching spikes or falling into the ever consuming Hell-maw will end the game. Fall combines several game mechanics into each element to streamline the gameplay experience and make it easy to pick up yet hard to master. It combines movement and directional input into a single button/direction combo. Use of this dynamic allows for increased movement and meaningful choice to navigate not only dangers but gravity itself. The verticality of the game provides both a progression mechanic and the end state. 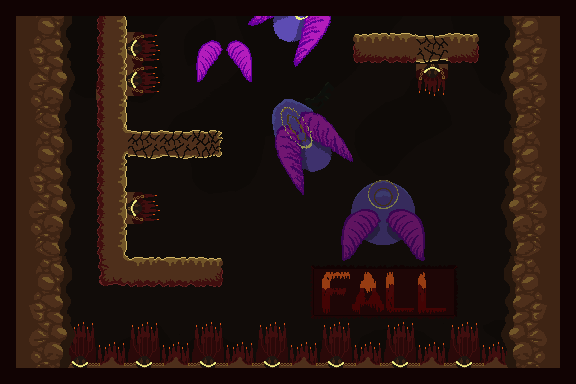 Players must control their ascent, avoiding spikes and platforms whilst also ensuring that they have enough spacing to not fall off the screen and trigger a game over. 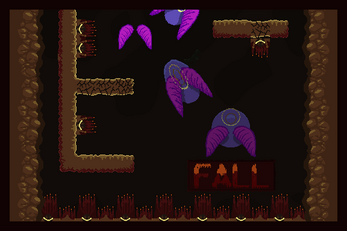 Obstacles in the game come in the form of solid and crumbling platforms. The solid platforms act as both a barrier when hit from below and the side, and also a rest stop when landed on from above. This combines with the time slow effect from the player's launch charge up to give the player respite in between the higher intensity gameplay sections. The collectable wing pickups provide score and drive navigational challenge for the player. They can choose to avoid more precariously placed wings in favour of easier to obtain ones higher up or seek them out for a more difficult experience. Lastly speed is both a benefit and a drawback while in the air. The player's slingshot allows them to redirect their existing speed into a new direction. Bouncing off walls and each subsequent launch increase this overall speed making each jump potentially more dangerous than the last. Landing on a platform resets the players speed thus allowing them to regain control of their motion. License information is included with the source code for the game. Windows: Open Fall.exe in the Build/ folder. Tested on Windows 10.